This gentle story is a conversation about God between a mother and a child as they get ready and make their way to kindergarten one morning. Told from the child's perspective, the series of questions and answers in rhyme introduces young children to the idea of a higher being that can see, hear and speak without eyes, ears or tongue, and does not live in a house with roof, walls and locking doors. "...For God's house is this world we share and God is in it everywhere." The tale was inspired by my younger daughter, who now has children of her own. 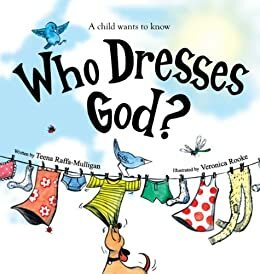 I do not normally read children's books but this one was brought to my attention by a school friend of 54 years standing. How can one not follow the recommendation. I bought the book immediately on Amazon as a Kindle e-book and read it on my iPad. Beautifully worded and presented with lovely supporting artwork. A feel good message that made my day.